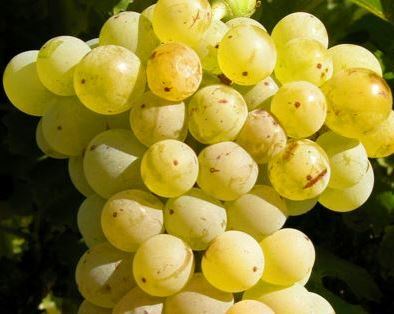 Grenache Blanc is one of the most important, white blending grapes in The Rhone Valley. Grenache Blanc is also popular in Spain, where it is known as Garnacha Blanca. In France, the grape is the fifth most popular white wine grape. In Spain, it ranks ninth. In Chateauneuf du Pape, Grenache takes up close to 2.47% of the appellations vineyards. While most growers produce the grape to be used as part of a blend, there are some winemakers that are producing wine from 100% Grenache Blanc in the Rhone Valley. However, these wines are meant for early drinking as they are prone to oxidation. Grenache Blanc is also used by some producers in the Cotes du Rhone as part of the blend for their red wines. The grape adds texture, licorice and floral characteristics to the blend. In the Roussillon area, Grenache Blanc is quite popular. In fact, close to 50% of all the Grenache Blanc vines are located in that appellation. In that region, the grape is most often blended with Roussanne and Marsanne. However, Grenache Blanc is planted in numerous areas in the Southern Rhone Valley including: Vacqueyras, Lirac, Tavel, Cotes du Luberon, Costieres de Nimes, Coteaux du Tricastin and Cotes du Rhone. As the name implies, Grenache Blanc is related to Grenache, the popular red wine grape. Researchers believe the grape was first popularized in Spain, which is part of the reason for its popularity in that country. Grenache Blanc for a food and wine paring works well with most types of seafood. However, it’s a perfect match for shellfish and of course, the famous dish of southern France, bouillabaisse, as well as cheese. Grenache Blanc, with its light skin adds elements of green apple, herb and minerality, along with floral scents and refreshing acidity. The grape thrives in the hot, dry and often windy conditions found in the Southern Rhone Valley. Grenache Blanc is also planted in California. The majority of the growers from the Golden State working with the grape are located in the Central Coast area, especially in the San Luis Obispo and Santa Barbara appellations. Some of the producers to look for making 100% Grenache Blanc in California are Jaffurs, Kinero, Shane and Tablas Creek. Tablas Creek is owned in part by the Perrin Family that also own Chateau Beaucastel. The grape enjoys some popularity in Australia as well where it is known as White Grenache.